Arms of the Jews of Judenburg. One of the oldest cities of Styria, Austria; the ancient Idunum. The name of Judenburg occurs in a document of 1075. Then there were many Jews in the district; Jews probably had been living there for a century. Influential, and in almost complete control of its commerce, they excited by their success the envy of the Christians, who spread and believed the most absurd reports concerning them. 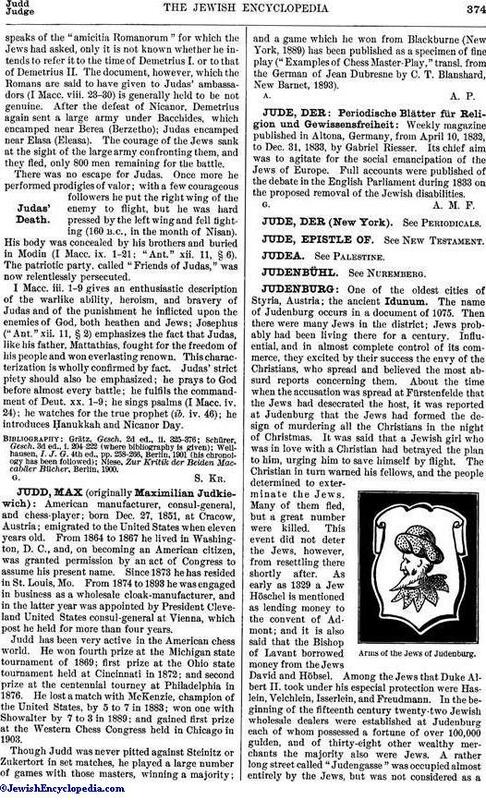 About the time when the accusation was spread at Fürstenfelde that the Jews had desecrated the host, it was reported at Judenburg that the Jews had formed the design of murdering all the Christians in the night of Christmas. It was said that a Jewish girl who was in love with a Christian had betrayed the plan to him, urging him to save himself by flight. The Christian in turn warned his fellows, and the people determined to exterminate the Jews. Many of them fled, but a great number were killed. This event did not deter the Jews, however, from resettling there shortly after. As early as 1329 a Jew Höschel is mentioned as lending money to the convent of Admont; and it is also said that the Bishop of Lavant borrowed money from the Jews David and Höbsel. Among the Jews that Duke Albert II. took under his especial protection were Haslein, Velchlein, Isserlein, and Freudmann. 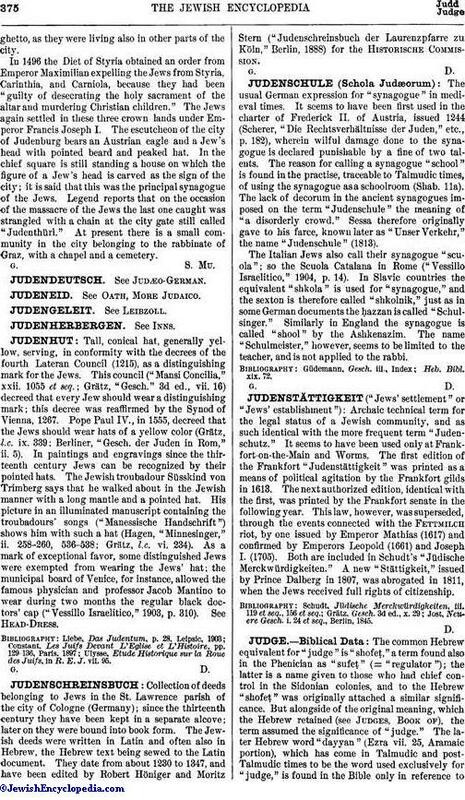 In the beginning of the fifteenth century twenty-two Jewish wholesale dealers were established at Judenburg each of whom possessed a fortune of over 100,000 gulden, and of thirty-eight other wealthy merchants the majority also were Jews. A rather long street called "Judengasse" was occupied almost entirely by the Jews, but was not considered as aghetto, as they were living also in other parts of the city. In 1496 the Diet of Styria obtained an order from Emperor Maximilian expelling the Jews from Styria, Carinthia, and Carniola, because they had been "guilty of desecrating the holy sacrament of the altar and murdering Christian children." The Jews again settled in these three crown lands under Emperor Francis Joseph I. The escutcheon of the city of Judenburg bears an Austrian eagle and a Jew's head with pointed beard and peaked hat. In the chief square is still standing a house on which the figure of a Jew's head is carved as the sign of the city; it is said that this was the principal synagogue of the Jews. Legend reports that on the occasion of the massacre of the Jews the last one caught was strangled with a chain at the city gate still called "Judenthürl." At present there is a small community in the city belonging to the rabbinate of Graz, with a chapel and a cemetery.